Echuet ganin adlenn En Ozeganned. Gw. laez ar pajennoù djvu/67 ha /68 (Bayon /60 & /61) : lakaet em eus an talbennoù rik evel er skrid met n'ouzon ket c'hoazh lemel ar re fazius kozh, pa ne zeuont ket war wel pa gemmer ar skrid OCR. E gwirionez, gwelloc'h eo ober gant un talbenn : Oustilhoù adlenn / Diskouez/kuzhat an talbenn ha traoñ ar bajenn. Aesoc'h e vo evit embann an destenn da c'houde. Sell ar pezh am eus graet gant ar bajenn /68. Kinnig a ran dit ober kement-all gant ar pajennoù all, hag embann an destenn. Thanks for your message. We are a small community (~5 active users), I'm the only active admin and I don’t do a lot of css/js coding (a bit of css here and there but I don’t master js and I’m only copy-pasting code from other Wikisources). Indeed it will be very little change for us. 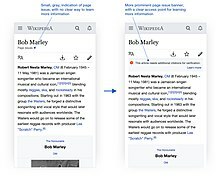 as announced previously, permission handling for CSS/JS pages has changed: only members of the interface-admin (Merourien an etrefas) group, and a few highly privileged global groups such as stewards, can edit CSS/JS pages that they do not own (that is, any page ending with .css or .js that is either in the MediaWiki: namespace or is another user's user subpage). This is done to improve the security of readers and editors of Wikimedia projects. More information is available at Creation of separate user group for editing sitewide CSS/JS. If you encounter any unexpected problems, please contact me or file a bug. Kemmoù diwezhañ degaset d'ar bajenn-mañ d'an 15 Mez 2018, da 17:34.